The MyCF web portal is a powerful tool that connects you to your college related information. Please take a few minutes to browse the tutorials below. If you don't find the answers you are looking for, please feel free to contact ITHELP@CF.EDU or call 352-854-2322 ext 1378. The "Welcome Back" or Login bar (A) is the dark blue bar located at the top of the screen. When logged in it will show your name. Clicking on 'Personal Info' (D) will take you to a screen that allows you to change your password and set various options regarding your privacy settings. By clicking 'Logout' (E) you can terminate your MyCF session. Site structure is broken down into a series of tabs (B). Each tab contains multiple pages and subsections of content that pertains to the general theme of the tab name. Which tabs you can see is determined by the roles that you have been granted. (ie, those in the Student role only see tabs that pertain to students while faculty and staff each have their own respective roles and tabs.) When a tab is selected it is a light gray color. The breadcrumb trail (C) is a means of navigating and keeping track of where you are in the portal. Each time you drill down a level in the portal a breadcrumb is left. To jump back up to a higher level within the portal simply click on that level in the breadcrumb. Using the back button in your browser is not recommended. The Sidebar displays the various pages and portlets that are available on the currently selected tab. Available pages (F) are displayed down the side in a blue box with bold text. Within each of these pages are portlets and other informational content. Within certain tabs you will see links with folders next to them (G). These are links to sections within that tab. A subsection is a subdirectory under the current tab but provides a new sidebar to navigate within. The sidebar also has a Quick Links section (H) where frequently used links are placed. There is also a shortcuts to your 'My Pages' . There are three options on the footer at the bottom of each screen. The privacy and appropriate use policy, about us, and contact us are located here. To login to MyCF, key in your CF ID and Password, then click the Login button. You must be a CF student or employee to have a CF ID. 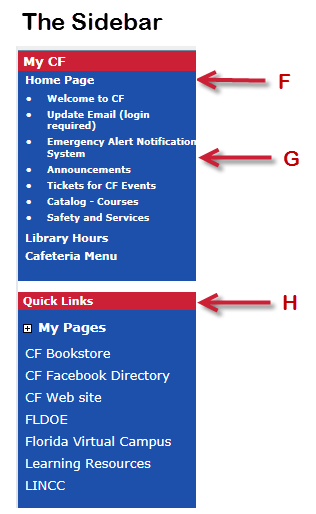 If you do not know your CF ID , click here . Change your default password after your first login. Protect your password and change it frequently. 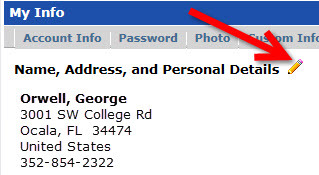 To change your password, click on the 'Personal Info' link next to your name after you log in. Provide your current email address by clicking on the link on the Home page. Providing your email address allows you to have your password emailed to you if you forget it. It also allows the college and your instructors to send email to you. Once logged in, click on the Personal Info link next to your name. Enter your Old Password, 8 character New Password and Confirm you r new password. Effective March 27, 2016, all passwords must be exactly 8 characters long! Click on the Save button to complete the password reset. 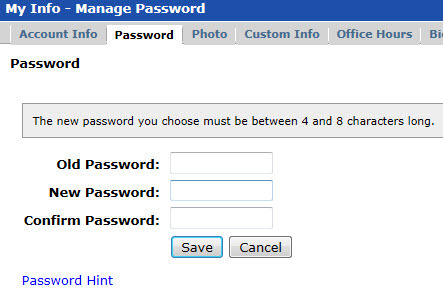 You can provide additional security for your account by using the Password Hint link. Enter your question and answer and click on the Save button. After entering the Hint Question and Answer, click on the Save button. 1. Personal Info is shown on the Welcome line. Click on Personal Info. 2. Click on Biographical Info. 3. Click on the pencil icon to edit your address. 4. Remember to Submit the changes! Please allow three to five business days for your change of address to be processed.